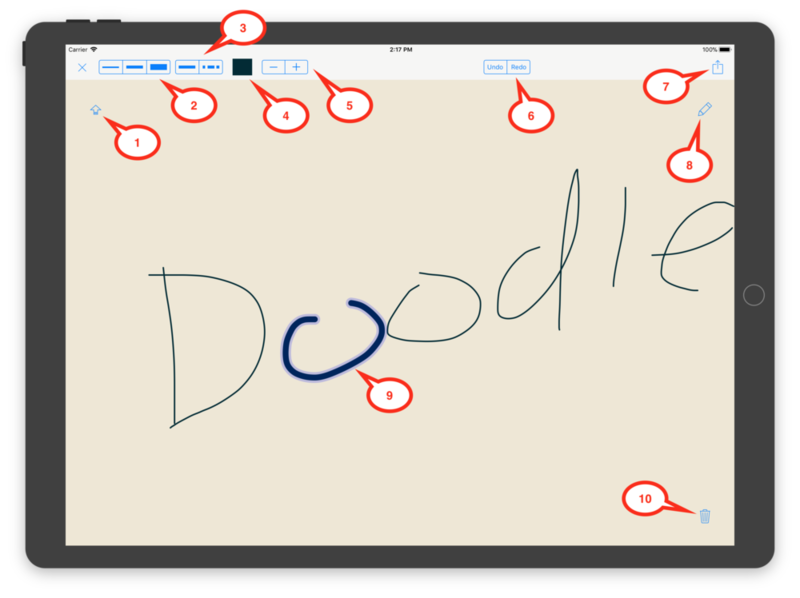 Doodle is a simple finger drawing tool within iThoughts. It is 'vector based' which means each line can be manipulated individually and continuously. Doodles can be attached to topics and exported as PDF, SVG or PNG files. Use your finger to draw lines (known as 'strokes'.) To move the canvas itself you must drag it with 2 fingers. This differs from the rest of the app, where a single finger is used to drag the canvas. If you accidentally draw a line when intending to drag the canvas (as I STILL do) then you can hit UNDO to remove it. Set the stoke thickness. If a stroke is selected then it will apply to that stroke. If no stroke is selected it will become the default for any new strokes. Apple pencil option. If enabled then you can only draw using the Apple pencil. A single finger drag will move the canvas. This option is enabled automatically if an Apple pencil is used. Tap on a 'stroke' to select it. When selected it will have a blue 'glow' around it. Once selected, any changes to thickness, dashed'ness, color or size will apply to the selected stroke(s.) Tap on a selected stroke to see Cut, Copy, Paste type options (including options to 'Send to Back') Drag a selected stroke to move it. Hold down the shift button whilst dragging to duplicate. The trash. Drag/drop a stroke onto here to delete it. Tapping it will delete the selected strokes.